Sitting on a balcony in South Beach, Miami, staring across the Atlantic Ocean, with a purple haze funk in the air, my thoughts take me to Spring Training. I'm looking forward to my good friend's wedding this weekend, and considering what it means to be here, there, or anywhere. Looking at the horizon over the sea open my mind. It is taking me over 2 seasons to get used to seeing Tom Crean coaching the Indiana Hoosiers. The reasons behind this are unclear, as I've easily adapted to college basketball coaches changing schools, like Tubby Smith, Pitino, Bill Self, Roy Williams to North Carolina, that jerk from Cincinnati going to West Virginia, and others. Perhaps it is because the news of Crean to Indiana flew a bit under my radar, when it happened. Where was I when it happened? Looking it up, it was April 2, 2008. Now, it makes sense that I'd not have heard since this is the height of baseball Opening Day anticipation. Okay, that one got away from me, sorry, a bit of a doozie. 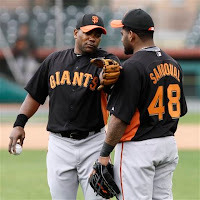 The reason I thought of Crean, whom of course I will forever identify with Marquette, is that I am now realizing that Miguel Tejada is on the defending World Champion San Francisco Giants. Tejada, who had moved to 3rd base a couple of years ago due to diminished defensive range will be moving back to shortstop for the Giants. If he can hit, he could be worth it, but his defensive placement will likely lead to higher BABIP's for Giants pitchers. The White Sox closer situation. Bobby Jenks and J.J. Putz are gone. Matt Thornton has been one of the best relief pitchers in the world over the past few seasons. We have praised Ozzie Guillen and Don Cooper in this space before for their abilities to handle a pitching staff. One aspect that hasn't received its due attention is how they would unleash Thornton at different times in the game, when he would be needed most. It's old school to make your best reliever your closer, but the new way of thinking leans towards using your best reliever when the game is most on the line. That could be with two on and two out in the 6th. Thornton, as you probably know, is left-handed. We haven't see many lefty closers outside of Billy Wagner and John Franco. Maybe that's because most teams have either zero or one really good lefty reliever. If that's the case, a manager will likely use him situationally while leaning on a few right-handed fireballers for the late innings. The White Sox are lucky to also have left-hander Chris Sale in the bullpen. He is a high pedigree player who was drafted and made his Major League debut in the same season, last year. Sale was drafted as a starter, but as young pitchers are groomed to throw more innings as they age, it can be prudent to limit his innings by having him pitch in relief for a few months or a couple of years. We like the way this Sox 'pen looks because Sale can be used like Thornton the past few years, Will Ohman can be a LOOGY, and Sergio Santos & Thornton can be relied upon for the 8th/9th. If you play auction style fantasy baseball, may I suggest targeting 1st baseman for a dollar or two. In Major League Baseball, if your first baseman isn't Doug Mientkiewicz, your 1st baseman can hit. The 20th best first baseman, for example will be able to hit relatively well, and much, much better than the 20th best at any other position besides of course outfield. With 3, 4, or 5 outfield slots in fantasy leagues, we would raise the comparison of 20th best 1st baseman to the 60th or 70th best outfielder. Last year, we did pretty well with underrated first basemen Gaby Sanchez, Aubrey Huff, and Jorge Cantu. This year, for a dollar or two, we could see Sanchez continue to emerge as well as a good return from guys like Brandon Belt, whomever starts for Arizona, and maybe even Brett Wallace or Xavier Nady. I've moved on to the Grove Isle Hotel in Coconut Grove, Miami. It is quite lovely and tranquil here, and spirits are high as everyone is here to celebrate a wedding with lots of love. It would probably be good for humanity if Joe Posnanski were inclined to write two or three thousand words on humanity every Saturday night. Read his thoughts from a bookstore here. Sizemore may never be the same. Is Kyle Blanks going to be any good this year? How about Grady Sizemore? Blanks is coming back from Tommy John surgery, and Sizemore had microfracture surgery. For now, I'd stay away from both unless I could get Sizemore as a backup outfielder and maybe Blanks could be a decent pick in the last round. Few amenities in life are as fulfilling to me as a heated pool. Please allow me to rephrase, few amenities in life are as unfulfilling as a non heated pool. Thankfully, the Grove Isle Hotel's pool is splendidly heated to the point where it's actually warm. Bliss. Back in the hotel room. It's not President's Day. The wedding was lovely. The band couldn't play Iko-Iko, which was ridiculous. We'll be flying back to New York in a couple of hours. Let's have a great week.